Leaf-peepers will fall in love with this eye-catching watercolor of autumn's peak foliage. 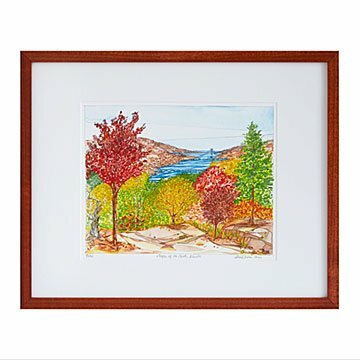 Leaf-peepers will fall in love with Maker Renee Leone's eye-catching watercolor of autumn's peak foliage on a crisp, sunny day. Fiery red- and bold amber-leafed trees dot the patch-worked hillsides along a cerulean bay. The chestnut-toned poplar frame of this warmly hued watercolor perfectly complements the artist's palette and geometric style. Renee creates a visual travel journal of iconic natural sceneries, which are hand signed and numbered prints in a limited edition of 250. Print made in Chicago. Frame made in the USA. Check out Renee Leone's other Regional Tree prints: Desert Cacti of the Southwest, Redwoods of the West Coast, Birches of New England and Aspens of the Rocky Mountains. Love this and her other works!